This weekend, in a fit of argh-I-can’t-find-the-pattern-for-the-skirt-I-want-to-make, I decided to embark upon another project entirely. Each year we make a point of going to the Maryland Renaissance Festival several times during the season. Usually, we dress up at least one of those times. And usually, I make new costumes for the whole family. Last year, we didn’t get to go at all, what with me and the Broken Leg Drama. The Renn Faire is not exactly broken-leg-on-crutches friendly. So this year calls for something epic, and possibly season ticket-worthy. I went through my patterns, of which there are many. I pulled out a few for each of us to choose from and showed them to Bill & Caleb. Caleb pointed at McCall’s 5500 and announced that he wanted to be, “A knight!”. I showed the pattern to Bill and noted that I had it in both Caleb AND Bill size. With some further probing, Caleb decreed that he would be a knight, like Captain America, with a sword and a shield. Notice I said “probing” not “prompting”. He came up with that all on his own. We packed up and headed to the fabric store and picked out some royal blue cotton poplin for the tabard, blue, red & white felt for the design, white rayon for the sleeves and, my favorite and the most expensive, royal blue corduroy with red and white embroidered stars for the pants. When I showed Caleb the corduroy he exclaimed, “That’s just like my Captain America!” Bill had decided to be be Captain America Knight’s nemesis, Red Skull Knight, in an army fatigue green ultasuede tabard with a red skull in felt. And just because I’m a follower, and I loved the blue corduroy, I will have a red on red stripe cotton/poly blend upholstry dress with a bodice made from the royal blue (with embroidered stars) corduroy. No official superheroine title, but we have a little time to figure that out. 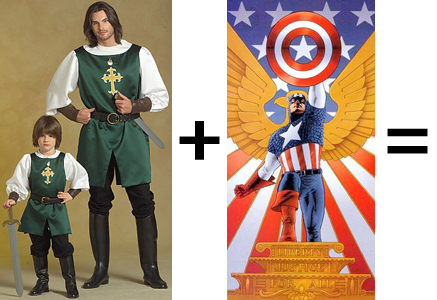 Speaking of “figuring it out”, anyone have a clever title for my little Captain America Knight? Captain New World doesn’t have that special ring to it. Tagged 5500, captain america, corduroy, costume, cotton, knight, mccall's, rayon, red skull, Renaissance Festival, royal blue, shopping, tabard, ultrasuede, upholstry. Capt Vespucci? Sir Starssen Stripe? Oh, for you? Look up Liberty Belle. See what you think. Oh, I LIKE Sir Starsen Stripe. 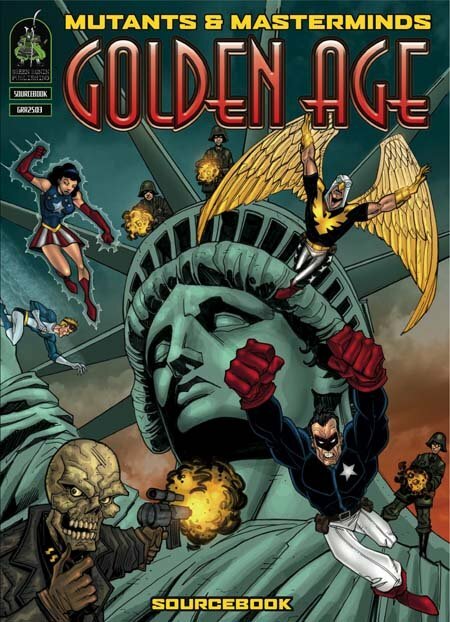 Maybe either the Golden Age ‘Lady Liberty’ or The American Dream for you. And I still think he needs to be ‘Sir’ instead of ‘Captain’. For you, how about Lady Columbia?